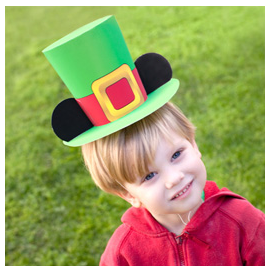 Let Disney Family help to get you & your little ones in a festive type mood with these fun holiday crafts. 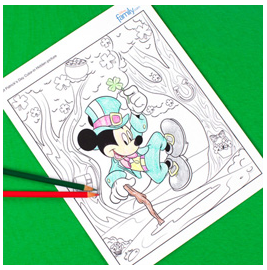 Celebrate St. Patrick's Day with your favorite Disney Character - Mickey Mouse. Make these as gifts or decorations for your home. Here's a Candy Box that you can create. 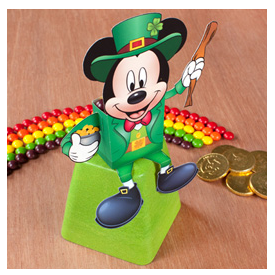 For an extra sweet treat, add chocolate gold coins or a rainbow of Skittles or M&Ms. 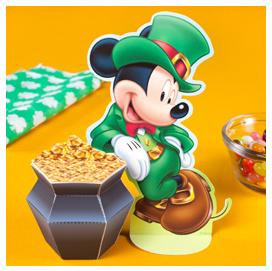 This Mickey Mouse with his Pot 'O' Gold would make a fun table centerpiece, or even something that an adult could put on their desk at work. Make a bouquet of Shamrocks for a loved one, like a grandparent or neighbor. 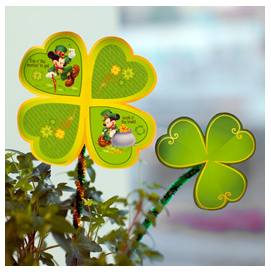 Add them to flowers or a plant, it promises to bring Good Luck to anyone who receives it.